Join us as we say goodbye to those we have loved and lost. William Kenneth “Bill” Norwood, 87, of Cleveland, TN passed away Wednesday at his home surrounded by family. A native of Polk County and a resident of Cleveland for 34 years, he was the eldest of three children born to William J. Norwood and Alice Stone Burnette, both of whom preceded him in death, along with his brother, Franklin R. Norwood. Survivors include his beloved wife of 63 years, Elizabeth Lyons Norwood; one son, Dennis Norwood (Mary Jo) of Matthews, NC; one daughter, Paula Norwood of Dayton, OH; one grandson, Daniel Norwood (Laura) and two great-grandsons, William and Anderson Norwood of Lake Wylie, SC; one sister, Mary Ellen Norwood Janes (James) of Benton, TN; several nieces, nephews and a host of friends and fellow veterans, including numerous Ex-POW’s and their families. Mr. Norwood enlisted at the age of 18 and proudly served his country as a Corporal in the US Army (24th Infantry Division). During the Korean War, he was taken prisoner and held captive for 2 ½ years – a period that shaped the balance of his life. 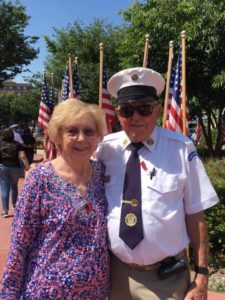 Upon his retirement from Top Value Enterprises, Mr. Norwood moved back to Bradley County with his wife, where they both remained active in numerous organizations dedicated to enriching the lives of veterans. Mr. Norwood’s military decorations included the POW medal, Good Conduct Medal, National Defense Medal, Korean Service Medal with ten battle stars, United Nations Service Medal, South Korean Government Service Medal, South Korean Government Presidential Medallion, and he met the qualifications for a Purple Heart. He was the Founder of the Korean War Ex-POW Association and served more than ten years as the organization’s president. He was also a proud recipient of the Raymond Miller Award, the Charles H. Coolidge Veteran of the Year Award and the Bill Norwood Award, which was established in his honor to recognize outstanding service to veteran affairs in the community. Mr. Norwood was a lifetime member of American Ex-Prisoners of War, Korean War Veterans Association, American Legion Post 81, Disabled American Veterans and VFW Post 2598 where he served as Chaplain, and was an honorary Lifetime Member of the Col. Benjamin Chapter of the National Society of Sons of the American Revolution. He also served on the Bradley County Veteran Funeral Honor Guard for 24 years. A visitation will be held on Monday from 5p-8p at Shenandoah Baptist Church (138 Osment Rd SE, Cleveland, TN 37323), with a funeral service occurring on Tuesday at 10AM at the same location. Burial will follow at Chattanooga National Cemetery where Mr. Norwood will receive full military honors. Companion Funeral Home of Cleveland will oversee all services (www.companionfunerals.com). Joseph Q. Tarbuck was promoted to Glory on February 7, 2018 at Gulf Breeze, Florida. He was a Circuit Judge for many years. He was born on September 13, 1931. Joe joined the Army right after graduating from High School in Harrisburg PA and was assigned to Hq Btry, 63rd FAB of the 24thInfantry Division on the Island of Kyushu, Japan. Joe went with his unit to Korea when the North invaded the South and was among the first Americans to be committed to battle in that war. His unit was overwhelmed and he, along with others, was captured on 7 July, 1950 and held until August 30th 1953. He was with the Tiger Survivors and participated in the Tiger Death March. 58 % of that group perish in captivity from prolonged exposure, being shot, freezing to death and other causes. Gone from us now and to be really missed, is our dear Joe, beloved by all. Our Brother, Private First Class Robert Fletcher, US Army, Former Prisoner of War, 27 November 1950 – 8 August 1953 has been issued his Final PCS Orders. Below you will find the dates and times for services this weekend in Ann Arbor, Michigan as well as Links where you can note your personal Condolences to Mrs. Fletcher (Carol). As noted, his final funeral in Arlington will be later this spring. We will share date & times when we receive them. A link to the funeral home’s website can be found here where electronic condolences can be left. Burial will follow in approximately 6-8 weeks at Arlington National Cemetery with full military honors. I am happy to provide you, or whomever would be appropriate, with the burial details once things are sorted out with Arlington. Mr. Fletcher’s obituary will run in MLive (our local online newspaper) on both Thursday, February 15 and Sunday, February 18. A link to the website can be found here. John (Jack) Powell in Waltham, Massachusetts passed away on Feb 10,2018. Jack was a member of the 2nd Division. Jack was captured in December 1950 and released in September 1953. While captured he was in Camp 3 and Camp 5. Funeral services will be on Thursday in Waltham and burial at a later date at Arlington National Cemetery. Colonel Ralph Parker Dixon Jr. Colonel Ralph Parker Dixon Jr., USA Retired passed away on Monday, November 9. I have attached his obituary with the permission of his daughter, Janet Dixon Nardone. This soldier was captured on April 25, 1951 and was in Camps #3, #5, and #2 until his release on September 4, 1953. Like many of those who served in Korea, Colonel Dixon went on to live a full life in the service of his country. Captured in Hoengsong North Korea Feb 12 1951 was one of the last to cross “Freedoms Bridge”… the “Bridge of No Return” Sep 6 1953. Declared a KIA but Came home Paul T. O’Dowd LTC. US Army Ret. American Hero Patriot, and my dad passed away at his home. He will be interned at Arlington VA. with Full Military Honors, Dec 3 2015. 3:30 pm . Any one wishing to attend please respond to the family. Thank you in advance for disseminating this to other POW’s. Martin Joseph Tullio was called to Glory today (October 19, 2015) at 7:43 AM. He was at his home at 38509-251stPlace S.E. Emumclaw, WA 98022-6808. He leaves his wife for life, Carolrae and many children and Grandchildren and assorted relatives. They will all be identified when I get the Obit. Martin was a member of A Company, 34th Infantry Regiment of the 24thInfantry Division and went with his unit from Japan to Korea during the first week of fighting in that war in July 1950. At the time he was a Private of Infantry and was released at a Private First Class. Martin (Marty) was captured by elements of the North Korean Army on July 10, 1950 in South Korea. He was a Prisoner of War for over 37 months and was released on August 30, 1953. He was held by both the North Koreans and later by the Chinese Army. He was on the Tiger Death March where 89 were shot to death. Marty saw 58% of the Tiger Survivors perish mostly under the North Koreans. While a POW Martin always helped his fellow Prisoners of War and carried them on the march. Martin is gone from us now to a better place I am sure. He will join other Tiger Survivors and help build our encampment in Glory. RIP Martin Tullio a great friend in life. Robert Dyer, from Camp #1 company #2, passed away today, May 10, 2015.